04/10/2011 - Governments and taxpayers spent about half a trillion US dollars last year supporting the production and consumption of fossil fuels. Removing inefficient subsidies would raise national revenues and reduce greenhouse-gas emissions, according to OECD and IEA analyses. 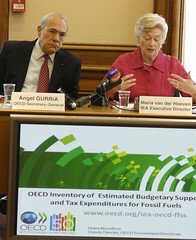 >> To receive a copy of Inventory of Estimated Budgetary Support and Tax Expenditures For Fossil Fuels please e-mail news.contact@oecd.org. For further information, journalists are invited to contact Ron Steenblik in the OECD’s Trade and Agriculture directorate by e-mail: Ronald.Steenblik@oecd.org or by telephone: + 331 45 24 95 29 and the IEA Press Office by e-mail: IEAPressOffice@iea.org or by telephone + 33 1 40 57 65 50.